SOME TIME AGO, I sat down to write out the top ten things I felt had changed when I began to take photography seriously. Later, I revisited that list and saw that I had changed yet again. That’s the nature of photography, I think: you are always learning. 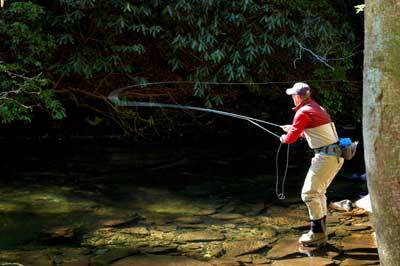 See, I had gotten this gig writing articles for flyfishing magazines — a lifelong goal — and one of best pieces of advice my editors gave me was that fly-fishing writing and fly-fishing photography are the same animal. That is, if you want to be successful at one, you must learn to do the other. I’d taken snapshots with a digital camera and I knew I was a visually literate person, but I’d never really set out to do any serious photography. Over the months that followed, I learned a lot, and I continue to learn every day. 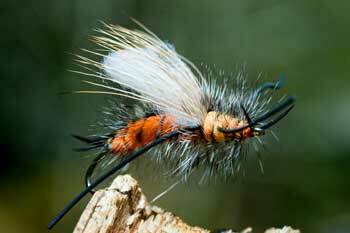 Here are some tips I picked up along the way that may help you improve your streamside work. The first thing I did was to enlist my wife, Lauren, who was already a talented amateur photographer. If you know someone who can provide you with the technical insights you lack into composition and camera science, approach that person. Making Lauren part of the effort was the best thing I could have done; not only did I get someone who could fill in the gaps in my knowledge, but I also gained a partner who would work with me and approach things from a different stylistic place. Together, we were able to improve beyond where either of us would have been on our own — not to mention having someone there to just push the shutter button when an idea occurred! Composition is the most critical element of photography. All the technical mumbo-jumbo in the world can’t save you if you don’t know where to point the camera. It helps to know a few basic rules — the Rule of Thirds, for instance. The Rule of Thirds is based on old principles like those the Greeks used to design their temples: imagine a tic-tac-toe board on your image, and place the point of interest on one of the points of intersection of the board lines. Most cameras have a grid option that aids this considerably. Of course, the old cliché that rules are made to be broken applies: if you see a better angle than the one the photo manual says to us, take it! One caution: do not fall prey to the desire to be the “amateur auteur.” Photography, for the most part, is straightforward and simple at its best. There’s no need to cut half of someone’s face off just to achieve an “artistic look.” Seek out artistic lighting and interesting subjects, instead. Remember, your audience is always much more interested in what you are photographing than in how you photograph it. The best photography shows the viewer the world as they wish they could see it — not what they would actually see. Think about going to a baseball game. Sure, you can get a lot of enjoyment out of watching A-Rod from the stands. But would you want to see the same perspective on the cover of Sports Illustrated? No. You pick up a magazine because you can see a person up close and personal — you want to be able to not just read the man’s number, but count the stitches on his uniform. 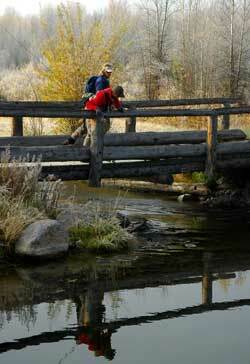 The same principle applies to outdoor photography, especially of other flyfishermen and of fish. 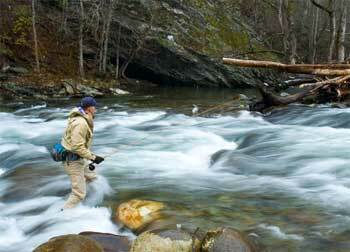 The worst thing a photographer trying to get a great fish shot can do is line up their subject in the middle of the image and snap away with a field of view that shows the entire river. When you get home, you’ll wonder what all the fuss was about. Flip that camera around to vertical and get up in your subject’s face. Fill your available space, and if necessary let some of the less critical stuff leak over the edges. Don’t be afraid to push right in there — your friend will thank you for it later. Speaking of approaching the subject, the best way to get truly good fish and bug shots — or shots of anything small, really, is to take advantage of your Macro feature. Macro is a camera setting on most point and shoots, and special macro lenses exist for DSLRs (although, perversely, Nikon calls theirs “Micro-Nikkors”). True macro photography renders the subject life-sized on the film or sensor. Of course, this means that when that image is blown up to the normal viewing size of, say, 8 x 10 inches, that little object is greatly magnified. This is the beauty of macro — you can see things you’d never see in person and view the world from a whole new perspective. Most cameras have a “Flower” setting which activates the macro feature set. Try it out and experiment to see what you get. This is truly what separates the men from the boys, so to speak, in the world of professional photography. All professionals know how to compose an image. All of them photograph interesting subjects. Only the most successful truly master the techniques of dealing with light, and I don’t yet claim to be one of them. Lighting is the area professionals worry the about most, because it impacts so many things. The light you work in affects your available depth of field, motion blur, the ability to make slow-water shots, saturation, contrast, sharpness — basically everything you can ask a camera to do. This is why pros spend so much money on f/2.8 aperture lenses — so they can gather more light. Working with light requires many things. One of the most important is being there at the right time. Unfortunately, in most circumstances, this means getting up early. Once you’ve given Nature her chance to show her stuff, you do what you can to fit your subject material into the tapestry she’s provided. Some days that tapestry can’t be helped — such as in high, bright light at altitude. In these situations, you need to use fill flash. As a matter of fact, with a modern DSLR camera, you’re safe leaving your flash on and metering all the time. Those cameras can light the flash just enough to turn out the best possible image, so trust your camera’s meter. If it looks wrong in the preview window, you can always tweak your settings. Of all the money you can spend in photography, two things are the most crucial: a digital camera, and a good flash. The advantages of digital cameras are legion; the ability to review images alone is single-handedly improving photography on a global scale. Modern flash technology is right behind that in importance. Need to light a buddy under his cap? Use fill flash. Want to add some color back to that silvery fish? Angle it carefully so the light isn’t broad-sided back, and use fill flash. Want to see more details in the fur of that elk standing over there? Hammer out some light with your flash. No qualified professional is without his tripod if he can help it. There are many situations in which carrying a tripod just isn’t practical, such as on hike-in fishing trips or on open water in a boat. Whenever it can feasibly be done, however, I bring along the tripod. You don’t need to go whole-hog and blow $800 on a tripod, despite what you hear, unless you’ll be using telephoto lenses in excess of $1,000 on a regular basis (those monsters are heavy). However, do invest in a sturdy set of legs and at least a light ball head. Ball head tripod mounts, which allow you to easily move your camera in 3-D, will quickly become indispensable to you. Why do you need a tripod? Simple: so you can take the slowest shot possible. In any given situation, a great rule of thumb is to take the longest exposure you can get away with. Why? Long exposures improve color saturation and show the natural world in a way you may not be able to mimic in a short snap. Long exposures, however, introduce several problems. The first is that there’s a lot of light in bright daylight. Use filters to cut light for longer exposures in bright sun. The second is, they introduce shake and subject blur. Subject blur is just a reality — when photographing fish, for instance, simply take a lot of pictures to get one where it holds still. Shake is where your tripod comes in. If you’ve ever tried target shooting, you know how difficult it can be to hit a small spot off-hand. Great slow-exposure photography is like that. Most people just don’t have the stability to hold in a shot much longer than 1/20s without introducing camera shake. Tripods also let you get those fantastic slow-water shots you see in magazines. The recipe here is pretty simple, really. First, set a long exposure, first. Second, use filters, stacked if necessary, to cut light on a bright day. Use a tripod, third. And last, set your flash for rear-curtain sync and fill flash your subject, just a little. Long exposures give water time to run and flow, overlapping itself on the exposure and making for a slick, cotton-like effect. However, a long exposure also allows a lot of light to reach the lens, so you need to cut it with filters (a circular polarizer at a minimum), and set a high aperture like f/22. (High apertures will have the effect of maxing your depth of field focus, so don’t try slow water shots which isolate a subject in a slice of focus except in very low light.) A tripod will keep you from shaking, but it’s also important that you use things like remote shutter triggers to keep from whacking the image from the get-go. Also, it helps to have a model who’s willing to stand still like he was at gunpoint! Dress your model in darker colors, if you can, as well – grays, tans, and greens tend to blow out, or over brighten, when exposed for too long. Personally, I prefer a deep red. Finally, that rear curtain flash setting will cause your flash to pop at the end of the image’s exposure. This has the effect of returning a natural sheen to things like leaves and sunglasses, as well as hitting the image with a sharp spike of light to hold your subject’s natural blur down by overlaying a sharper image right at the end. Use this trick only with a modern camera and a modern flash; it’s too hard to compute how much light you’ll need at the end otherwise. 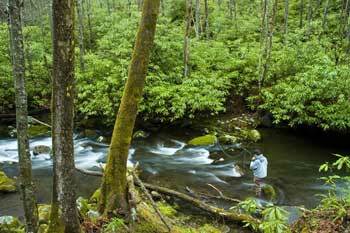 The fish shot is the moment of truth for most would-be outdoor photographers. Magazine sales numbers show that anglers want to see big fish. Period. If you happen to be the photographer on hand when a lunker is landed, you have an immediate opportunity to make a salable picture, so long as you don’t blow it. Here’s how I do it. First off, talk to your fisherman. The number one thing he needs to know, in our sport of dedicated catch and release anglers, is that you are not going to kill the fish. 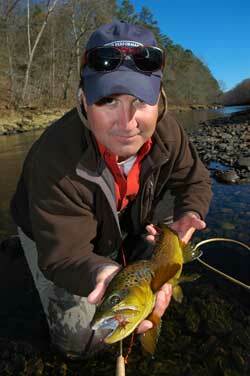 Properly handled, any trout can survive a decently-long photo session. I said properly handled, mind you. When your angler lands his fish, keep it in the water and get it in a net. I paid to have a photographable net, a nice looking wooden one, because I knew the net would make the shot whether I liked it or not (and it has since been in American Angler several times). Have your fisherman suspend the net rim out of the water while leaving the fish in the bag as you get set up. If you have a tripod, use it. Set up your flash, get your camera turned on and ready to go, and check to be sure none of your previous settings are doing things like bringing your exposure down three stops. Then, get your fisherman set up. I tend to like him kneeling or sitting in the water rather than stooping — it adds perspective to the fish and keeps faces normal, not to mention being more comfortable. Take off sunglasses and hide ostentatious logos where possible. This is a good time to mind your manners, so have anglers who dip or smoke set down the offending object for the time being. 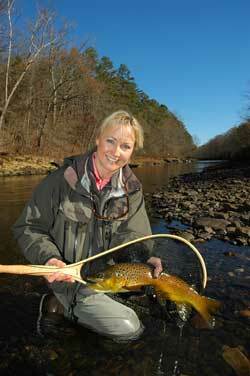 Keep the rod in the picture, and the fly in the fish’s mouth, and get yourself to a low angle. When the time comes, simply say ‘now,’ and let the angler lift the fish out of the net. Have him angle it slightly so the head is closer to the camera than the body (a better optical trick than the arms-length grip and grin, since it forces the eye to assume perspective length). 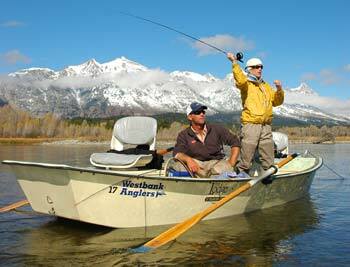 Snap off a few shots, then have the angler return the fish to the net. Review your images. If they are what you want, let the fish go. If not, repeat the process. I get asked a lot of the time how I protect my cameras on the water. The answer is simple: common sense, and insurance. I don’t believe a camera that spends its time in the waterproof boat bag is worth having along, so I always carry mine on my shoulder, easily accessible by me or Lauren. Because it is almost inevitable that my camera will eventually take a dunking, I invested in a personal articles policy with my insurer. For about $15 a month, I have enough coverage to replace all the gear I own, including all my fishing equipment. The other most common question I get asked is: “which camera is right for me?” There are a ton of choices out there, but there’s nothing I dislike more than asking for a recommendation and being told to check out the world. So, here goes: if vest space is an issue, I recommend Pentax’s excellent Optio Waterproof series. These cameras are small, waterproof, and high quality. They are designed for the amateur and are built to be idiot-proof. They also pack high quality digital sensors that will easily make a wall-mountable photograph. In experienced hands, they can make publishable images. For the more ambitious photographer on a budget, I recommend the Nikon D50 or its Canon Digital Rebel equivalent (disclaimer: I’m a Nikon guy). The DSLR camera market is currently undergoing a considerable amount of consolidation, so it is very difficult to predict who will be around to supply your camera with lenses in the next five to ten years. Your best bets are the industry leaders, Nikon and Canon, and I strongly recommend choosing one of these two brands. The Nikon D50 is a digital SLR camera like you might have used ten years ago. It accepts interchangeable lenses, professional flashes, and is capable of technical image-making the point and shoots just can’t match. At under $800 with a lens, it’s also about the most affordable quality DLSR on the market. For the professional writer or photographer who’s looking to make the switch to digital, I will stick my neck out and suggest Nikon’s new D200. This class of user tends to already know what he needs, and my advice is probably worth little. For what it’s worth, the D200 is capable of making 10-megapixel images that will enlarge to two pages in most major periodicals. It is weather-sealed and carries Nikon’s newest technology. Currently, there isn’t really a Canon equivalent — although that will surely change in the near term. This camera is the best professional value on the market right now. Photography is likely to be a life study for me, and I will certainly continue to learn, but I don’t really have any fear of looking back on this article in a few decades and laughing at myself. The basic premises of photography are more or less immutable. No matter how good the technology gets, the most critical factors will remain the same: point the camera at beauty, catch Nature at her finest, and do your best to get out of the way.